Either this is blooming early this year, or we've made it to late summer while it's still technically July. 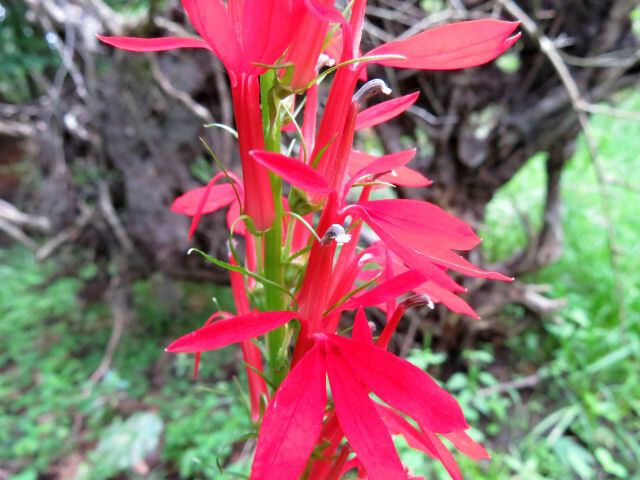 Here is the beautiful cardinal flower. I've shown you this before, but its stunning color is always good for a smile. 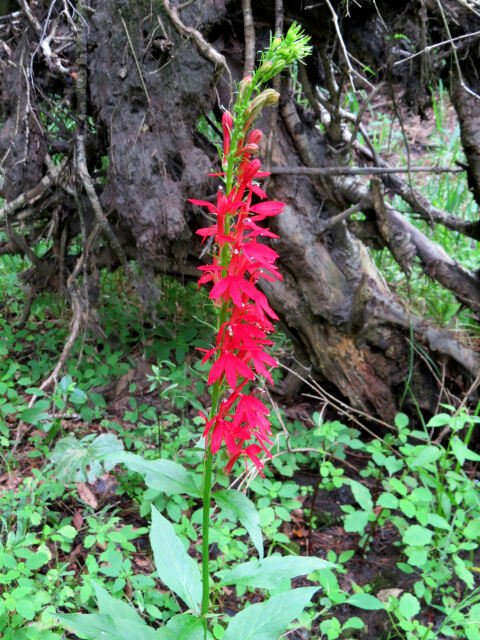 When you are walking through a shady woods, in a wet place, don't be surprised to see a fiery stalk of flowers so exotic they look like they came from a tropical isle. I think the color was even brighter than the picture shows. They really are amazing. And look at those flowers! 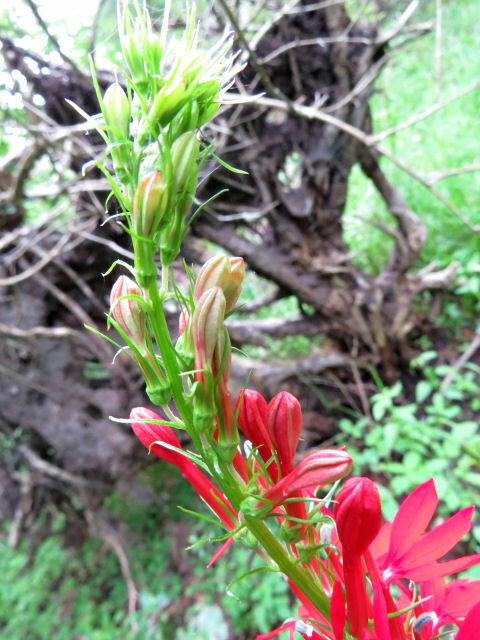 Note the weird little "wire" with a tube hanging above the bright petals. That's the business part of the flower. The petals are only about attraction. This was just over by the cemetery pond. I went there again today for a different reason, and you'll see the results of that effort tomorrow. Stay tuned! In 2010, I switched from boots to trail runners (essentially sneakers with mesh tops and extra support) and have never looked back. They have been great for my feet. 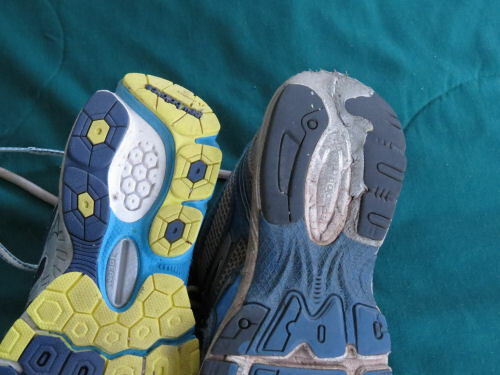 In fact, they solved all the foot problems I previously had on hikes, which made us conclude that the underlying cause of all the issues was that my feet were too hot. Anyway, even in shoes my feet like, there comes a time to make a change. I knew I was sort of pushing the time limit of the pair I'd been wearing, but there were still no holes in the tops. They just didn't feel quite as good as they had. It seemed like my heels were getting a bit sore, but walking on hardened surfaces will do that. On the big Ohio hike this year, we had to trim a flap of loose rubber off the bottom of one shoe, and we bought Shoe Goo (highly recommended) to fill in the gap. I wore that off before the end of the trip. So I decided to look for a new pair. This is always a challenge for me. But on the way home I spent a night with Chuck and Sylvia (they claim to like me! ), and Sylvia and I took a quick trip into Grand Rapids to do some errands. A sporting goods store had a sign by the road about a huge clearance sale. It was pretty early in the season for shoe sales, but I said "let's stop," and Sylvia, who was driving, executed a fast turn and found a parking spot. "It won't take long," I said. "They'll either have something I can wear or not." There are never many choices in small sizes for fussy feet for a girl who won't wear pink or purple. Lo and behold, they had my brand and my size in an acceptable color. One pair. Marked down from $115 to $45. Can you believe it? It came home with me. So, we finally get to the point of this story. Look at the heels of the old pair and the new. 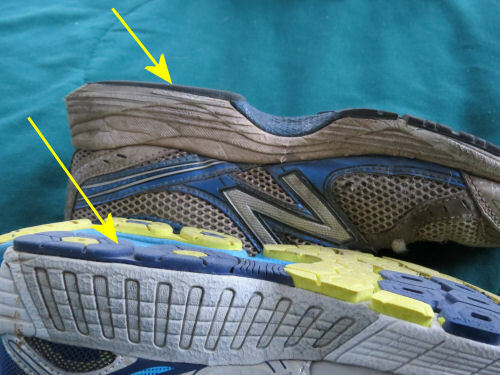 They've changed the tread design, but these are basically the same shoe in the same brand. No wonder it didn't feel like there was much padding there. Side view. Look how much that outer layer had worn down. They wore pretty evenly, so I hadn't realized how bad they were. And I had the good sense to replace them before we had a real trail crisis. One pair, I had to drill holes in the rubber with my knife and tie the sole back on with nylon cord for the last two days of the hike! I'm loving my new hiking shoes. They feel great! 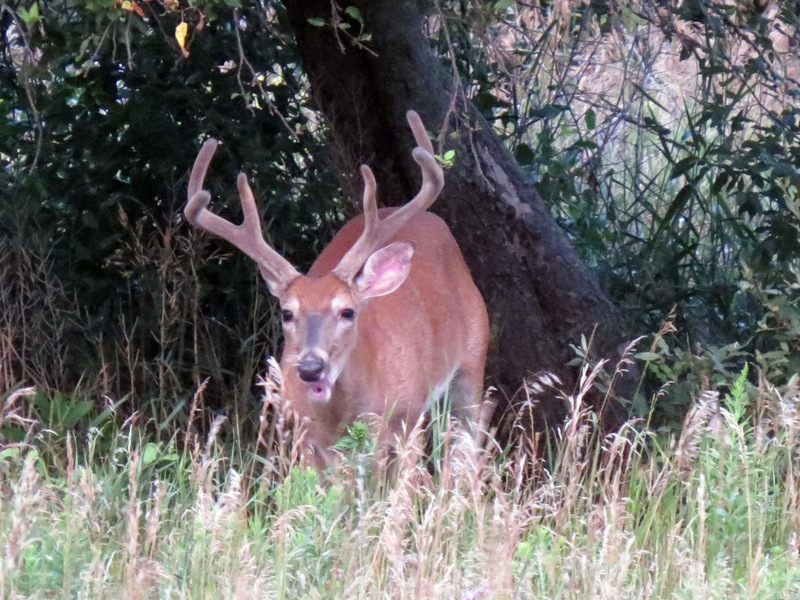 Even if you are a large and mighty six-point buck in gorgeous velvet, you can still be caught on camera looking silly. He took the time to check on what I was doing (even at a very long camera range) with the apple still in his teeth. 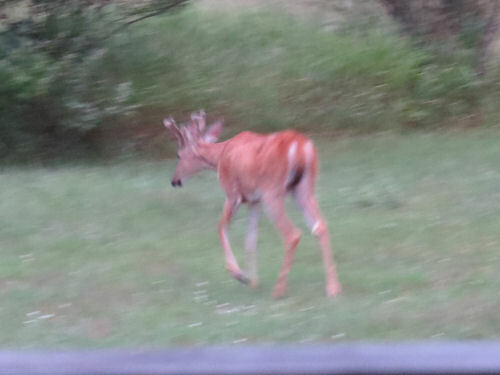 So I came to the other side of the house, and junior size was prancing through the back yard. 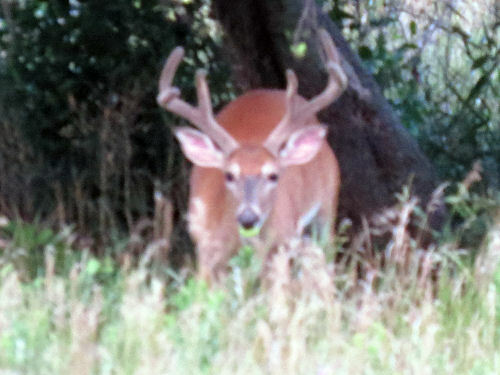 Even though he's only about half the size of the big guy, he's got four points. But I think he doesn't know what being a buck means yet. He didn't even pretend to be in charge. Sorry about the quality of some of the shots, but at least I got something with which to tell the story. It's hard to tell you how much I dislike this plant. 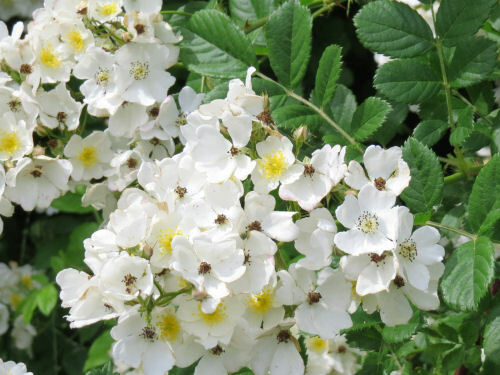 It's multi-flora rose, Rosa multiflora. There's a scientific name you can probably get your head around. 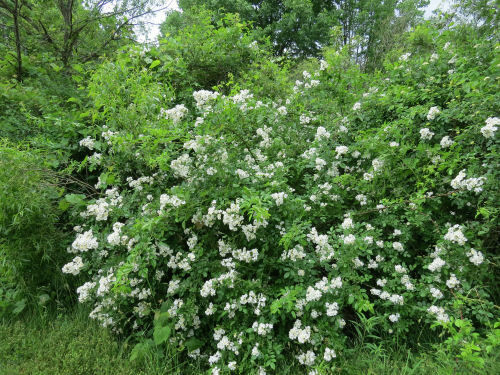 It's alien; it's invasive, and it's obnoxious. Seems like I've been combating it for years. 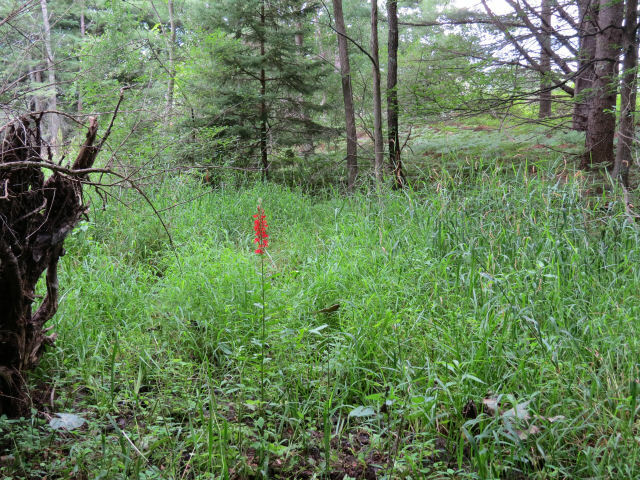 Not on my property, thankfully, but it has to be cut and dug out from all the places where native plants are trying to be preserved. It will overrun everything in sight. The same thing applies to trail work because it grows so fast and is so nasty to get caught on it's hard to keep it in check. It's full of thorns and you really have to cover up to work in it. And yet, it's so pretty. Darn. You can easily see why it's called multi-flora. I didn't take many pictures on my Cincinnati hike. It was hot and I was using all my energy to walk. However, there were a lot of great older houses near the river. 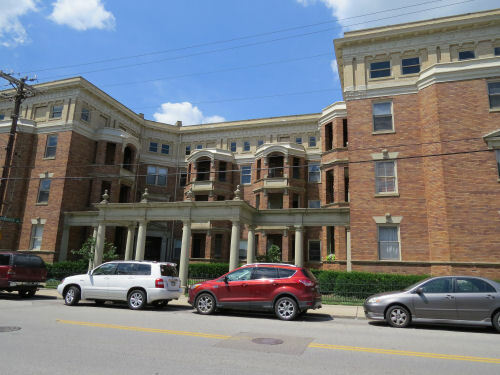 I particularly liked this stately apartment building. 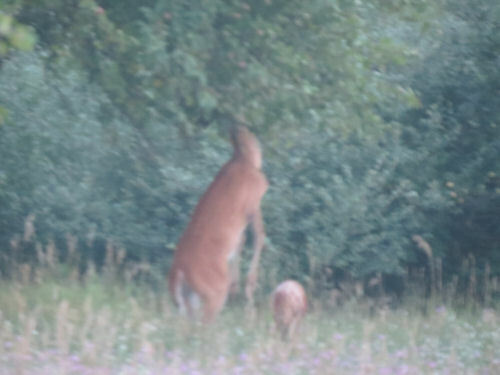 The picture is horrible, with wires and cars, but I wasn't waiting around until I got a better shot. Notice the semi-enclosed court in front and the concrete pillars that contrast with the brick. I'm thinking classic 1930s. 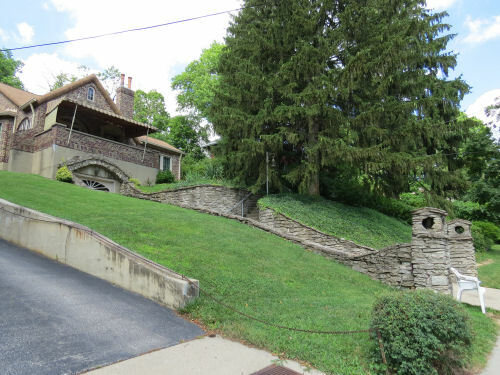 I also really liked the eclectic stone work along the driveway for this home. But the best was this place. 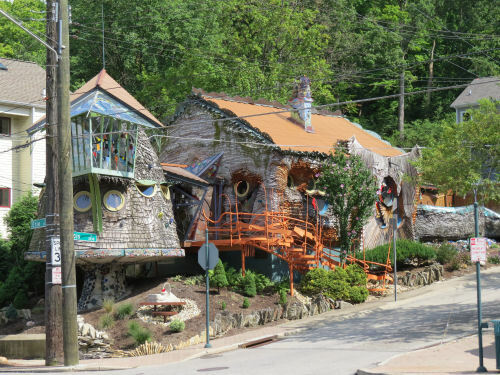 It's become something of a tourist attraction and is known as the Mushroom House. I'm taking you back to Stan Hywet in Akron, Ohio one more time. I want to show you longer views of four themed gardens. I should have asked how many gardeners they employ. It must be a crazy number. 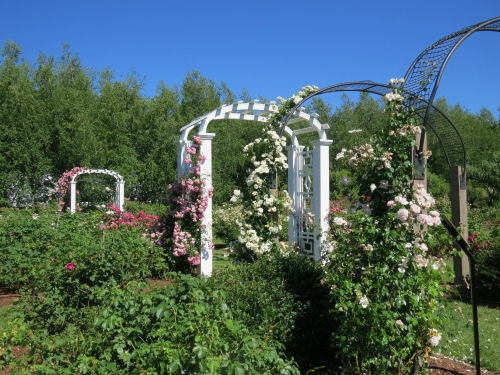 The first garden you see after you enter (there are flower beds everywhere, but I'm referring to a semi-enclosed space with a particular theme) is the Rose Garden. Actually, I'm not a big fan of roses, but the avenue of trellises made a nice visual line. 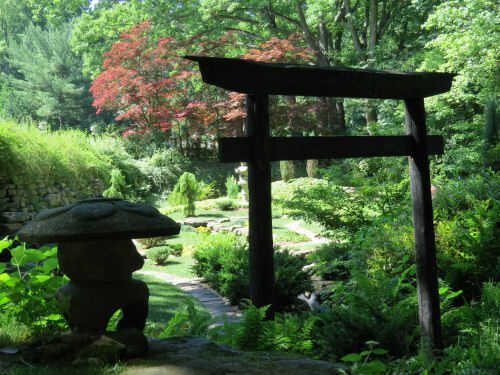 Directly in back of the house is a Japanese Garden. This is placed in a naturally lower area, but I think some of the rocks that turn it into a bowl were moved there on purpose to create the space. It was quite lovely. The walled English Garden was where I learned the names of several plants because things were labeled pretty well. There was also quite a lot in bloom. The reflecting pond was nice, and I tried some interesting shots, but they all turned out rather average. The last place we visited in the afternoon was the conservatory, filled with tropical plants and cactus. Outside that was the Children's Garden. It was loaded with bright colored flowers and various places to play, including a splash fountain. It wasn't set up in a way that you could get a picture of the whole space. 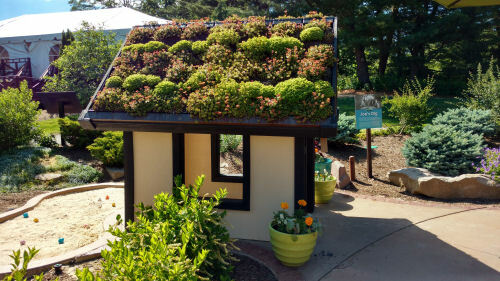 So I'll just show you this playhouse with plants on the roof. The deer have eaten most of my flowers. There are almost no buds left on my day lilies, and the hosta are all chewed. 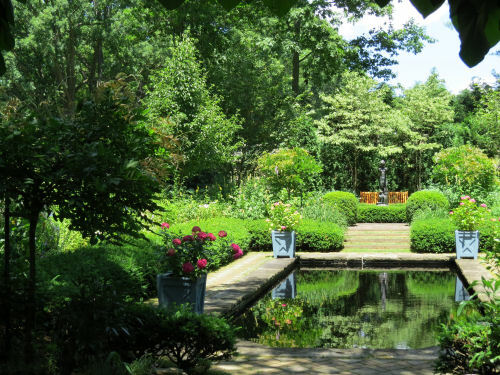 I think I should give up trying to raise my own flowers and get hired by some place that has extensive gardens like these, with plenty of money to care for them. I had to go to Grand Rapids today, and of course couldn't chance being late, so the interstate was my route going there. However, coming home I got to play one of my favorite games... just take a road going in the right direction and see where I end up. There was one stop I had to make on the way, so the road had to wander there, but it wasn't time constrained, so I had a blast. 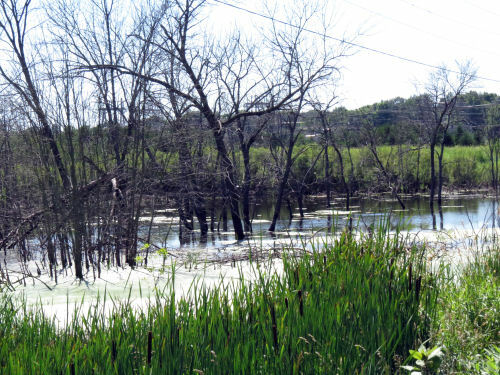 I loved this small wetland beside the road. 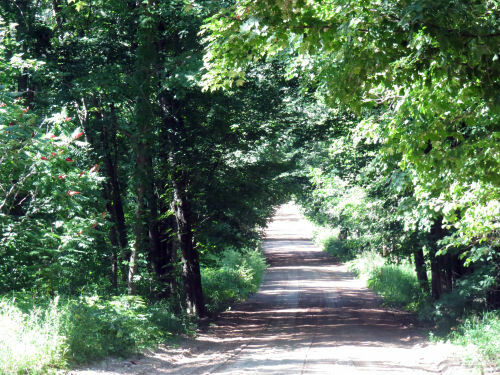 And you know I found a couple of really good back roads. This is 132nd Avenue (between Pierce and Baseline if you are local and care). These pretentious names on seasonal roads always crack me up. Another stop at the White River was on the agenda. I needed to collect information for my newspaper column. And finally, I discovered another place to get a nice view. This is on 128th Avenue, just south of Clock Rd, looking north. This is two-week old news now, but I quit the job that had me driving all over several counties. Increasing constraints with no increase in pay... anyway. So, I won't be out and about as often, unless it's for something I want to do. We had some great thundershowers and rain this morning. It's still too hot, but it helped. I did get the inside of the house under 85 degrees. 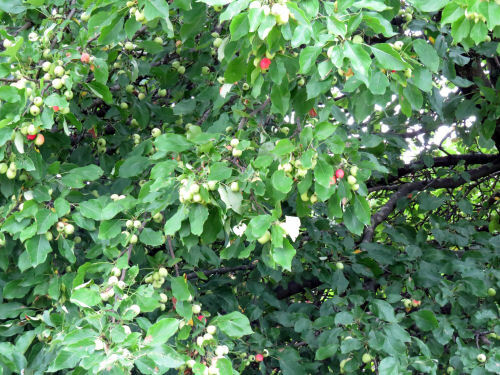 Look at the crabapple tree. It's loaded. If I can get my act together this fall, I can make a lot of juice. The defining feature of the day was heat. Wow. I did get some laundry done, and worked on a database project I've become obsessed with. But I didn't move far or fast. Neither did Trouble. This is Riley's offspring who has stayed around. I think Trouble is a good enough name for him/her. We can't have the bird feeders any more because we can't afford to feed the squirrel(s) too. 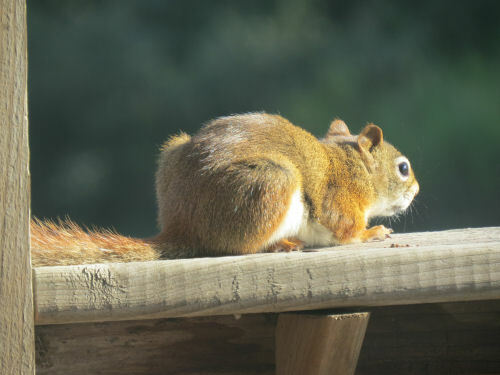 We now have a fox squirrel hanging around too, and they are really pigs. And I think Trouble chews more than Riley did. Anyway, these pictures were taken on a different hot day, but Trouble was pretty much slowed to a crawl as well. 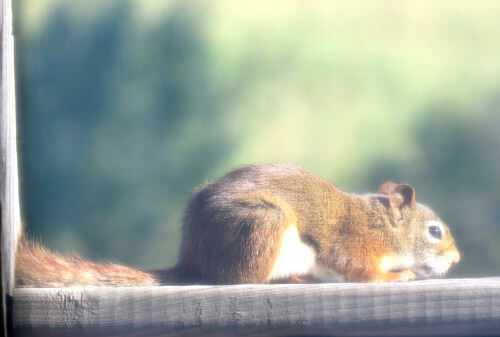 I took the pictures because I've never seen a red squirrel just lie down and look less than alert out in the open like this (on our deck railing). Here's one through a cleaner window. But it was oppressive enough today to keep me pretty much in a chair with a fan on. No doubt about the quality in today. Lots of work and too hot and humid, but I bought a new kind of melon to try. It's called Lemondrop. Wow! It's like a honeydew with more than a drop of lemon. I like it a LOT. Not quite ripe. I'll bet it gets even more lemony. 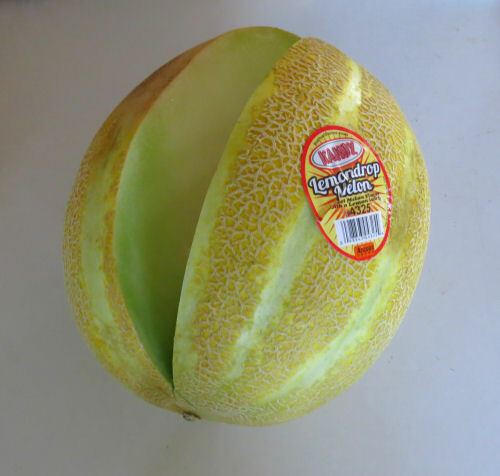 Notice the skin is like a cantaloupe with smooth pale green stripes, in case you see one and it's not labeled. 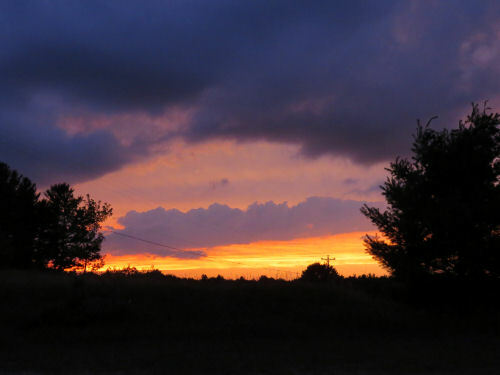 And I can't resist showing you last night's sunset. Sorry about the wires. They are there. What can I do? I'm off to work soon. Cooler at night and the building is air conditioned. Still hot, but not like working outside. I feel bad for people who had to work outdoors today. And, it's my dad's birthday. He would have been 112, and he died 40 years ago yesterday. Link below if you didn't see previous post about him. I'll probably show you a few more things from Stan Hywet another day, but I did something interesting this morning that I want to share. 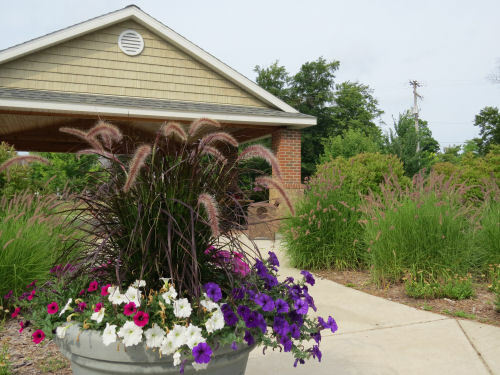 There is a small town about 45 minutes from me that has quite a few parks, and I wanted to research them to use in my newspaper column. So I went there and collected information for a couple of hours before the rain started. I had to come back to get to work anyway. 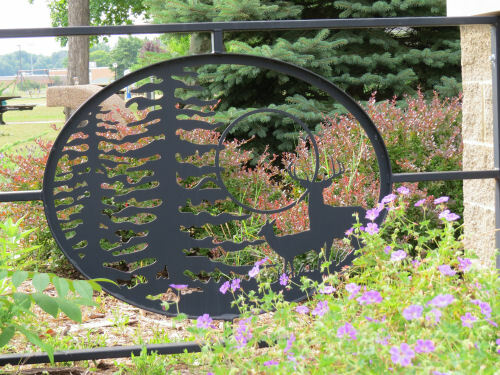 They just added a "history trail" to the central park in town. 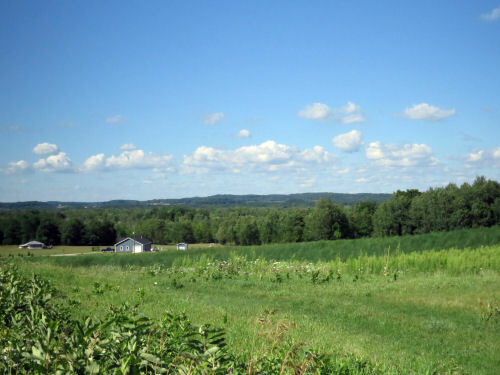 I read about that in the Oceana County weekly paper, and that's what kicked off my interest. Hesperia has fewer than 1000 residents so I hadn't thought of it as a big recreation location, but they actually have quite a lot going on. The main park is Webster Park. It's nicely decorated. They've just added 13 interpretive panels along the perimeter sidewalk. It was pretty interesting reading. This isn't one of those signs, just part of the entrance gate that I liked. 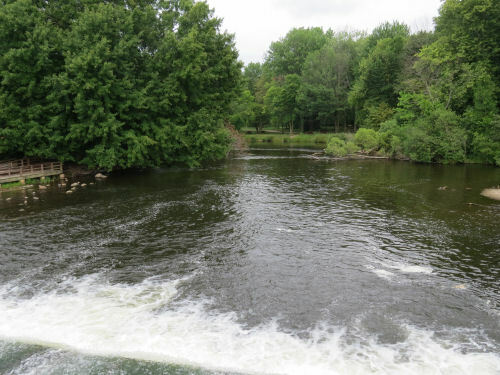 The primary natural feature of the town is the White River, and the dam which has supplied power for various industries since about 1867. 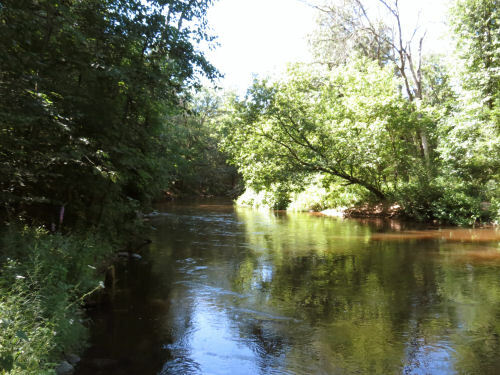 Now it provides recreational fishing grounds. There was a short trail beside the lake above the dam. 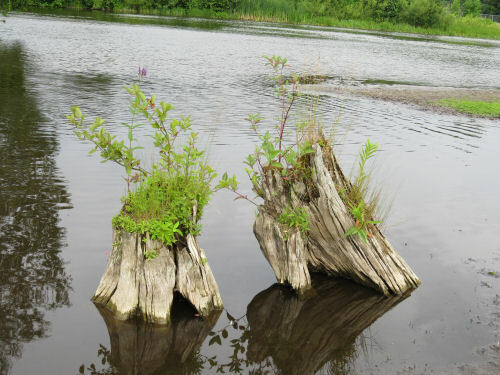 I just liked these two stump terrariums. Caught pictures of two interesting birds. 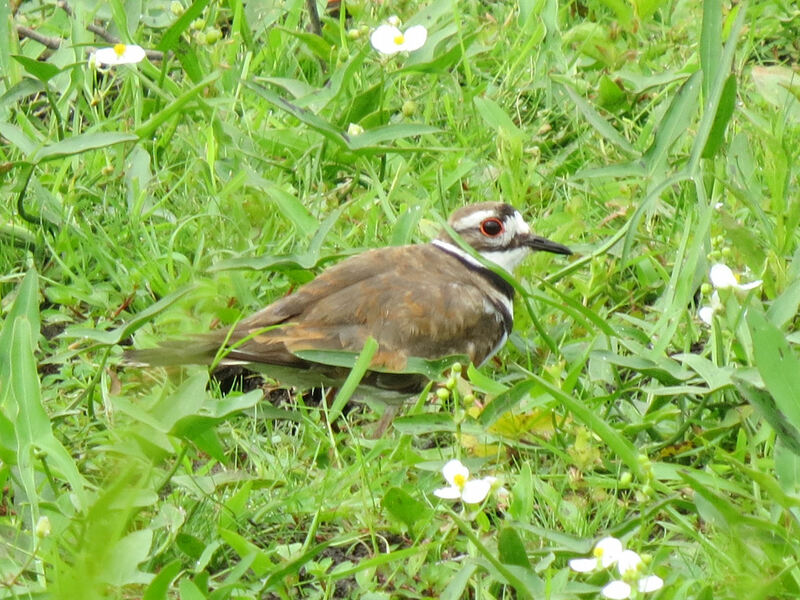 There were a couple dozen killdeer on the mud flats along the lake. I don't think I've ever seen so many killdeer in one place. It seemed odd. Perhaps there was some invertebrate they found particularly tasty. I did get a very bad picture of a kingfisher. It's not worth showing you. I did, however, catch the footloose robin. Quite a few of them actually. 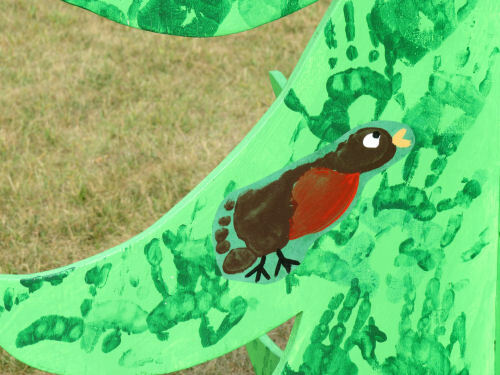 The town was decorated with plywood trees which had been painted by school classes. I liked this one. I need to go back on a day with bluer sky to get nicer pictures.